In Detroit, for that glorious game of soccer-on-ice-with-sticks, we—I still say “we”; you can never separate yourself from your birthplace—know what to do with octopuses, octopii as were: We toss them on the ice. In Germany, they use them as crystal balls. Paul is its name. He is an octopus. And he has, so it is reported, correctly predicted the result of each German game this World Cup. How? Well, inside Paul’s tank are two clear boxes, and inside each of them is placed a clam, one labeled “Germany” and the other the name of the opposing country. Paul slithers aquatically down and opens the lid on one of the boxes and eats the poor clam inside. A sacrifice in the name of science! In other words, whoever gets eaten is predicted to win. Paul has become so popular that his gastronomic guesses are broadcast live. The attention afforded this briny beastie has been such that he is now eligible to join the bizarre celebrities list, which contains such luminaries such as Paris Hilton, Lady Gaga, and Al Gore. [Argentinians] threatened to kill the octopus and put him in a paella. The newspaper El Dia even gave a recipe for anyone daring to capture Paul: “All you need is four normal potatoes, olive oil for taste and a little pepper.”…Bookmaker William Hill is so impressed by Paul’s predictive powers that it was offering even odds that he will pick the winner of the final on Sunday, between Spain and Holland. Well, of course! Offering anything but even odds—which transform to a probability of 50%—would be nuts. Which brings us to the question: what are the chances a delicious-when-served-with-red-wine-sauce (I have never forgotten my boyhood first serving in Greektown), eight-legged sea creature can predict German World Cup games accurately? Glad you asked. Germany has, in this Cup, played 6 games thus far. (They play again four hours from now.) Paul has flawlessly predicted each game: 4 wins, 2 losses. Given that Paul is just guessing, and that the teams were equally matched, the probability of 6 accurate predictions is just under 2%. This is the same as flipping a coin and seeing a Head 6 times in a row. How does that 2% feel to you? Has Paul has pulled off a miracle? Is he the Neptunian equivalent of Nostradamus? If you think so, would you trust this slimy seafood to pick the stocks in your 401(k)? Or would you limit his prognostications to World Cup games? Don’t answer yet, because Paul has a feathered rival. Mani the parakeet, who hails from Singapore. Reports are that Mani correctly identified all four semi-finalists. But that’s only four games (that we’ve heard of), which is not as impressive as Paul’s record. Besides, if you watch the video, you can clearly see that Mani’s owner has a great deal of say in Mani’s choices. Almost as if Mani is being directed! However, it’s the fact that Mani exists and is being tracked which is important. For you can bet that there are other animal totems whispering predictions to their owners that we never hear from. What about Bennie the Bedbug? Or Sammy Squirrel? Lost to history! We only know of the those that have gained at least moderate success. Those who offer failed predictions are forgotten, or rather, they never come to light. For example, if there are, say, 200 animalistic auguries the world over, there is greater than a 95% chance that at least one of them would match Paul’s record. 200 is a small number! There isn’t a cat-owning female out there that doesn’t feel her companion is at least partially psychic. And let’s not even start with fish owners. Well, what about today’s match? Paul chewed the German clam and eschewed the Uruguayan one, which, of course, says that Germany takes third place—and wins the trophy nobody wants but that nobody cannot turn down. Bookmaker William Hill was wise to set the odds even for this prediction; that is, Hill is saying there is a 50% chance that Paul will be right. The chance that Paul guesses 7 in a row, for teams that are equally matched, is just under 1%. But what if the teams aren’t “equally matched”? Suppose it’s the Germans against St. Mary’s Elementary school. Then the chance Paul is right drops dramatically. In the games in the Cup were like this—behemoths against sweet peas—we’d quickly see that Paul stinks at picking winners. Thus, it’s only because the teams are roughly equally matched that Paul had any chance at all of appearing prescient. There’s a reason why the first syllable in augery is a shortened aawwwgghh! Having a 100% chance of picking a team with a 50% chance of winning is different than having a 50% chance of picking a team with a 100% chance of winning when it comes to overall accuracy? Which brings us to Bill Miller. Bill Miller manges the Legg Mason Value trust. Mr. Miller successfully beat his becnhmark 15 consecutive years. An awesome feat. But, with the number of professional money mangers out there. Someone was going to do it. I shouldn’t mock the poor beast, though, since it is English, (born in Weymouth), and has had the most successful World Cup of any Englishman. Apart, hopefully, from referee Howard Webb, (who, despite his name, doesn’t walk on water). 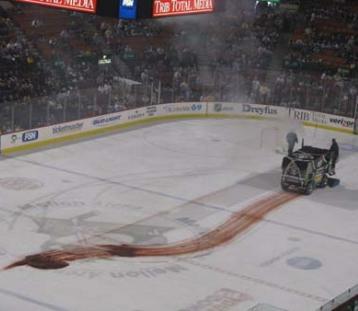 That octopus on the ice better watch himself.